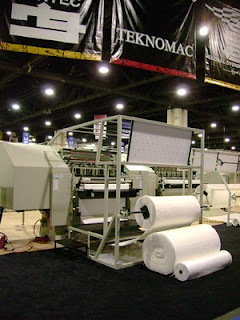 This dedicated border quilt machine, from Gribetz International, was a popular topic at the ISPA Expo. This quilt machine's footprint is about half the size of a typical mattress panel quilter. The Border Quilter has incorporated slitter blades on the exit side and slit border material is collected on a wind up roll. This works well as a part of a mattress border work cell as displayed in GSG booth 2625. This machine is capable of producing enough border material to match two mattress top panel quilt machines, depending of pattern selection. This allows mattress manufacturers to keep full size quilters dedicated to producing top panels while this machine churns out complementing border material.